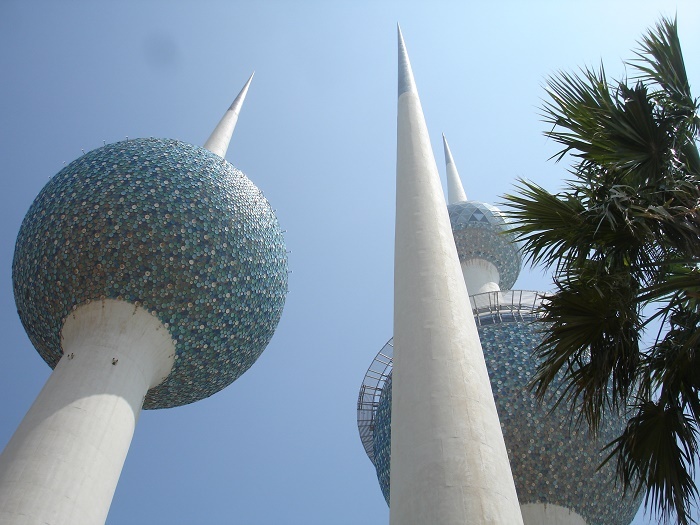 The Kuwait Towers are a group of distinctive and easily recognizable three towers that are located in the capital city of the State of Kuwait, Kuwait City. 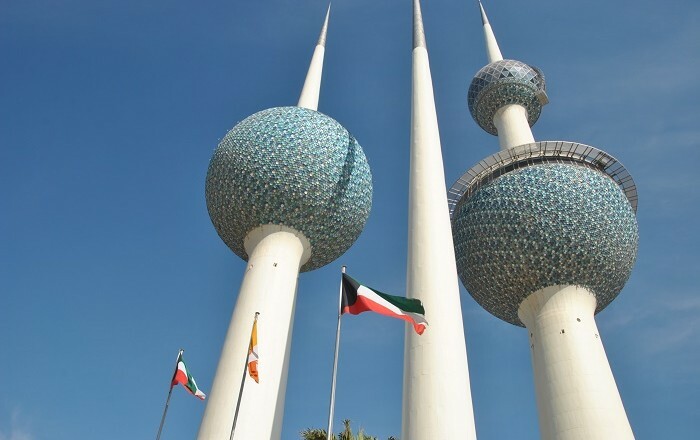 These three slender towers are symbolizing the economic resurgence of the small Persian Gulf country, as well as representing a major touristic landmark. 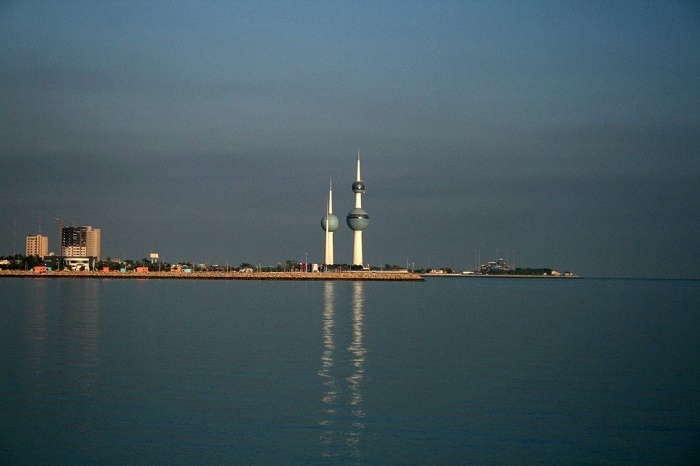 Sometimes they are referred to as they are single tower, even though there are three tall structures. 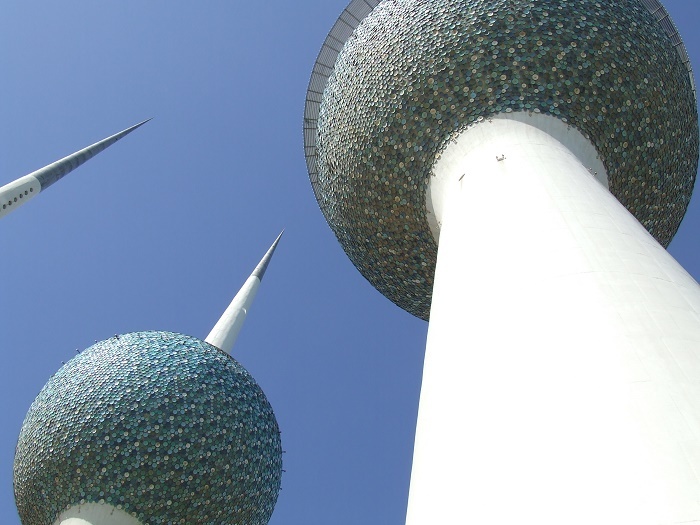 As in the previous projects, it was planned throughout the city for water towers to be built, and named of course Kuwait Water Towers, these ones are the sixth and last ones of 34 towers. 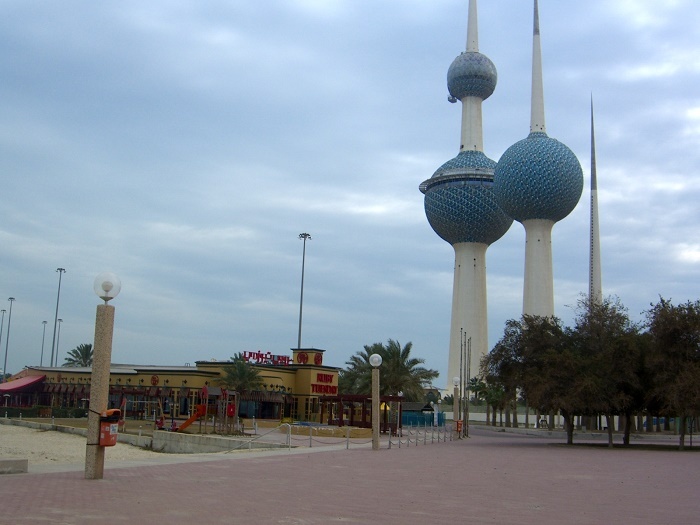 They are very different in architectural style from the others, and officially they have been inaugurated in March 1979. The total height of the tallest and main tower is 187 meters (614 feet), according to the design of the Danish architect Malene Bjørn, and has two spheres. The lower sphere which is divided into two parts, holds water in the lower part, and in the upper part there is a restaurant that can accommodate up to 90 people. 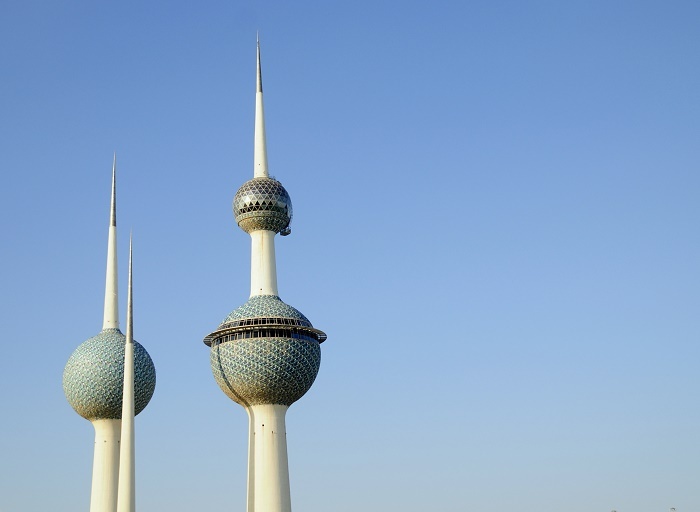 The higher sphere stands at 123 meters (404 feet) and serves as a viewing place for the surrounding as well as the entire capital city. 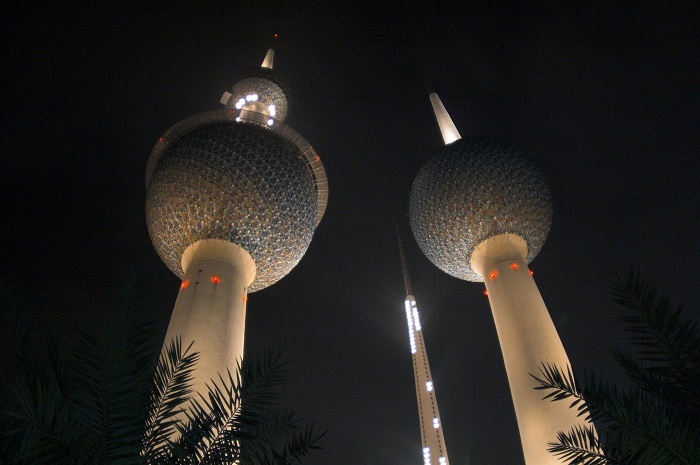 The second tower which has a strong resemblance like the tallest one, is used only as water tower with a height of 147 meters (482 feet), however, the third smaller tower is housing the equipment which is used to illuminate the two larger towers. 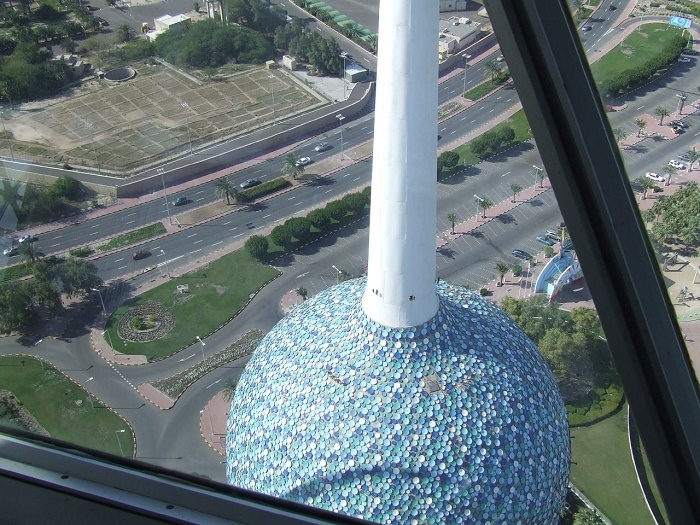 Around 41,000 enameled steel discs have been used as a construction material for the exterior of the tower which gives them that unique white and blue recognizable color, which can be found in historic mosques. However, for the interior the Yugoslav company Energoprojekt, used reinforced concrete and prestressed concrete. Nonetheless, the viewing platform that rotates at the highest tower offers quite the spectacular sights, which in the past offered only a desert, and today the entire city has been transformed into a beautiful city skyline. 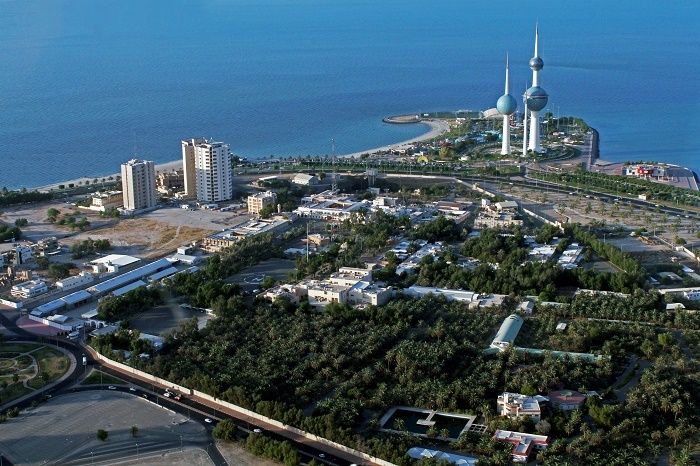 Still giving the breathtaking view also of the Persian Gulf, the Kuwait Towers will stay as a major landmark of the State of Kuwait.